Gold remained choppy overnight in a range of $1331.15 - $1339.20, trading against movements in the US dollar. It sank to its low of $1331.15 (supported by 50, 40, and 20 day MA’s) as the DX reached 89.97 on soothing comments from Chinese President XI that he would open the country’s economy, lower import tariffs on automobiles, and promised to enforce the legal intellectual property of foreign firms. Global equity markets cheered the news, with the NIKKEI up 0.5%, the SCI +1.7%, Eurozone shares up from 0.6% to 1.1%, and S&P futures +1.1%. Gold was able to bounce back to $1336 during European time on a combination of bargain hunting bids and comments from the Fed’s Kaplan (trade issue with China won’t resolve soon, reiterated his dovish base case of just 2 more rate hikes this year). Later on, the DX collapsed through support at yesterday’s 89.81 low to reach 89.54 (2- week low) as the euro surged ($1.2325 - $1.2378) from hawkish comments from the ECB’s Nowotny (ECB could lift deposit rate to -0.2% from -0.4% to start rate normalization process, favors ending bond buying this year). A miss on the US NFIB Small Business Index report (104.7 vs. exp. 107) also weighed on the greenback. Gold ran higher, and broke through yesterday’s $1338 high to reach $1339.20 ahead of the NY open. At 8:30 AM, a stronger than expected reading on US PPI (0.3% vs. exp. 0.1%) lifted the US 10-year bond yield from 2.79% to 2.812%. The DX bounced to 89.84, and knocked gold back to $1336. However, the dollar’s strength proved short-lived as US stocks pared some gains on their open (S&P +25 to 2638), and the 10-year yield slid to 2.783%. 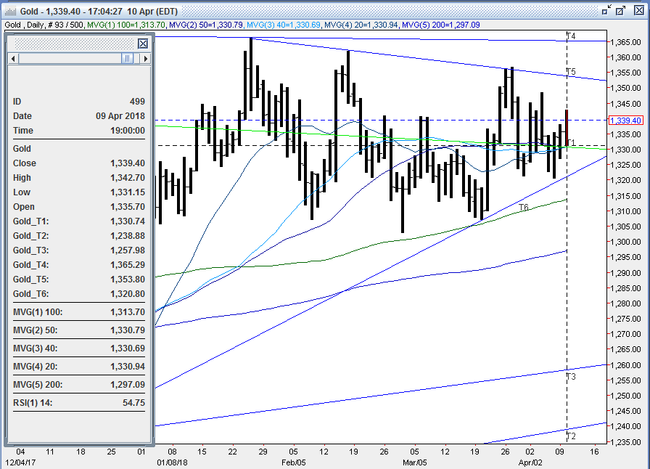 The DX dipped back to 89.56, and drove gold to $1341. US stocks turned sharply higher by mid-morning (S&P +50 to 2663, energy and materials lead gainers), helped by a surge in oil (WTI from $64.20 - $65.25; lessened threat of trade dispute that would sap global demand, Syrian issue) aided the move. The DX was supported by the stronger equities, and then spiked higher (89.82) on a statement from an ECB spokesman that Nowotny’s earlier comments were his own and do not represent the views of the governing council that pummeled the euro back down ($1.2324). Gold sank in response, but once again found support at $1336. Into the afternoon, US stocks remained firm (S&P finished +44 to 2657), helped by Facebook shares ticking up while CEO Zuckerberg testified to Congress on its data leak. The 10-year yield hovered around 2.80%, but the dollar drifted down to 89.58 as the euro bounced back to $1.2360. 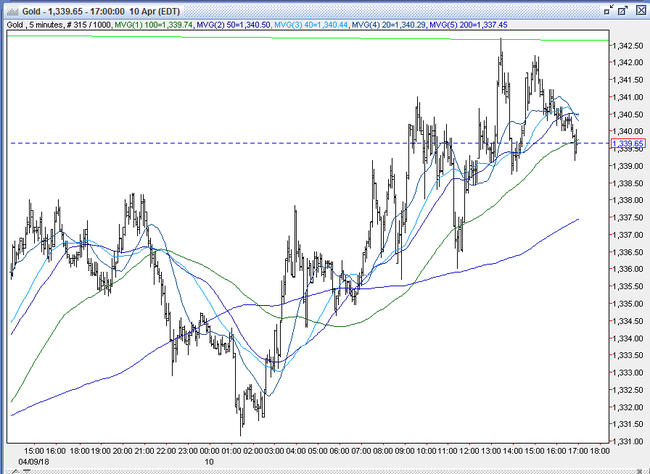 Gold rallied and took out its prior high to reach $1342.70, and was $1340 bid at 4PM with a gain of $4. Open interest was off 1.2k contracts, showing a net of short covering from yesterday’s advance. Volume was lower with 242k contracts trading. Bulls enjoyed today’s advance, especially in the face of a 44 point gain in the S&P. They believe that the trend in the dollar is still down, and expect further weakness in the DX to drive gold higher. With the current favorable large fund positioning from Friday’s COT Report, bulls look for a breakout over resistance at the double top at $1347-48 (3/28 and 4/2 highs) to trigger a cascade of buy stops over next resistance levels at $1356-57 (3/26, 3/27 highs), $1362 (2/16 high) and $1365 (down trendline from 7/6/16 $1375 high, 5 tops - 1/25, 8/2/16, 8/3/16, 8/4/16, and 8/5/16 highs) to challenge the 7/6/16 high at $1375. Bears will continue to be comfortable selling into strength, knowing that gold’s forays north of $1340 have been rally graveyards for months. They still believe a major bottom in the DX from 2 months ago is in place at 88.25, and expect its rebound to resume (but are concerned with the recent hawkish chatter that is fueling a stronger euro). The bears will look for a test of support at the double bottom at $1321 (3/29 and 4/6 lows), and expect further long liquidation to come out below this level to bring into play the $1307-10 support level. All markets will continue to focus on the volatility in the equity and bond markets, geopolitical events, developments with the Trump Administration, oil prices, and will turn to reports tomorrow on Japanese Machine Orders, Chinese PPI, CPI, US MBA Mortgage Applications, CPI, Oil Inventories, and the FOMC minutes from 3/21 for near-term direction.